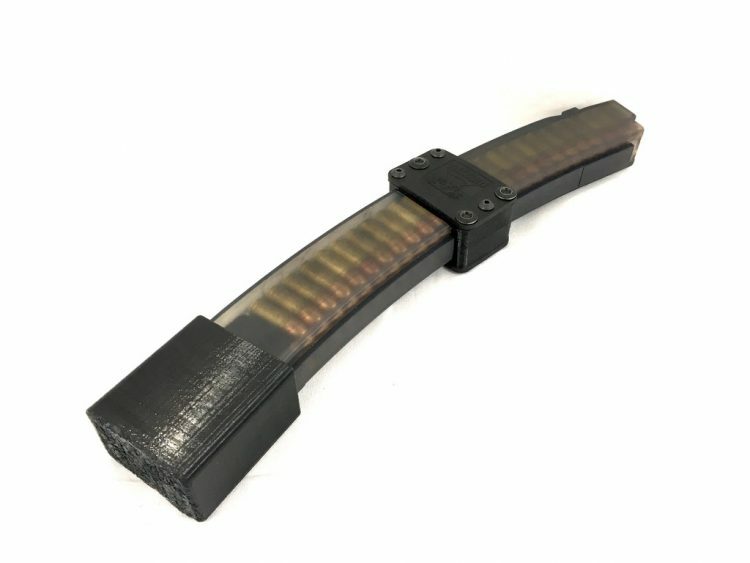 The TACCOM feed ramp is designed to be used with ‘GLOCK’ Magazine lowers and Standard AR15 uppers, without the use of the BHO feature in either the upper or lower, where the gap between the back of the barrel and front of the magazine is .200” or more. 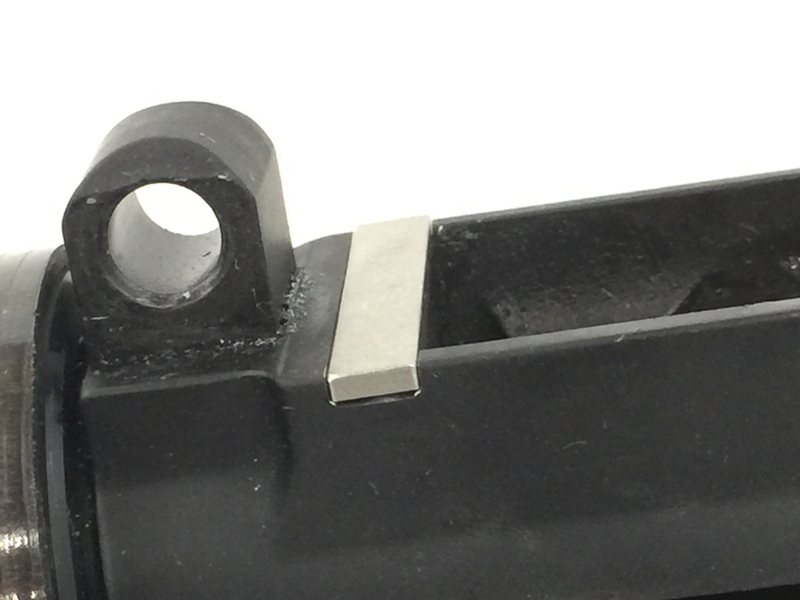 The design to fix the flawed design of many lowers based off using the Glock 9mm Magazines, our feed ramp is easy to install with hand tools (or use of a milling machine if you prefer). The ramps is designed to be held in place when the upper and lower come together. 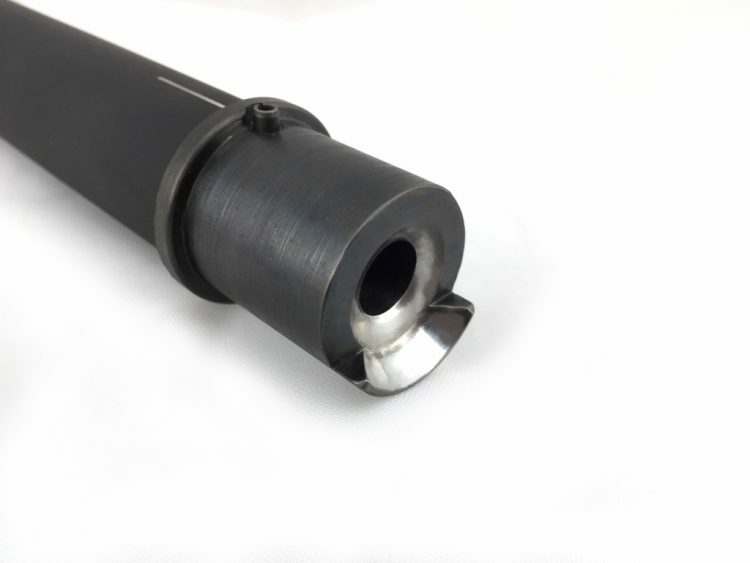 Once installed, the round will glide up the feed ramp and into the barrel’s chamber. I bought this as I was having 2-3 malfunctions a match with my JP GMR-13. I just shot over 2000 rounds through it without a malfunction. I had it installed at a local machine shop for $25. On the JP it did require fitting to get the magazines to drop free. I also installed it on my buddies Battle arms upper with nfa lover and it did not require fitting. Buy it but be prepared to fit as required. Hollow points would not feed in AR-9 pistol, so I decided to give this a shot. After installation, it now feeds everything. Installed it in about a half hour using only a small file. Going to put one in my competition carbine as an added precaution, even though I haven’t experienced any feeding issues with the round nose bullets I use in competition. Well worth the modest investment for increased reliability. Almost gave up on PCC until I found this gem. Tried all combinations of adjusting my ammo with little reliable improvement. Put this on and now it runs like sewing machine. Highly recommended. I am ordering a second unit as a spare. The feedramp literally took me 5 minutes to install with a file. Tim was very helpful in answering my questions on placement. Easy enough to install with a file. Simple part does a great job at solving feeding issues. Took 1 gun from not running at all to running 100% and will be installing another in one with occasional failures to feed. Great little piece, highly recommend! This deflector has made a world of a difference. Before I had to only use round nose ammo and still had some difficulty. Now I can use hollow points as well. Feed reliability has increased dramatically. I did not attach it as suggested, I would not be able to clean behind it. Used a small file for it to fit. 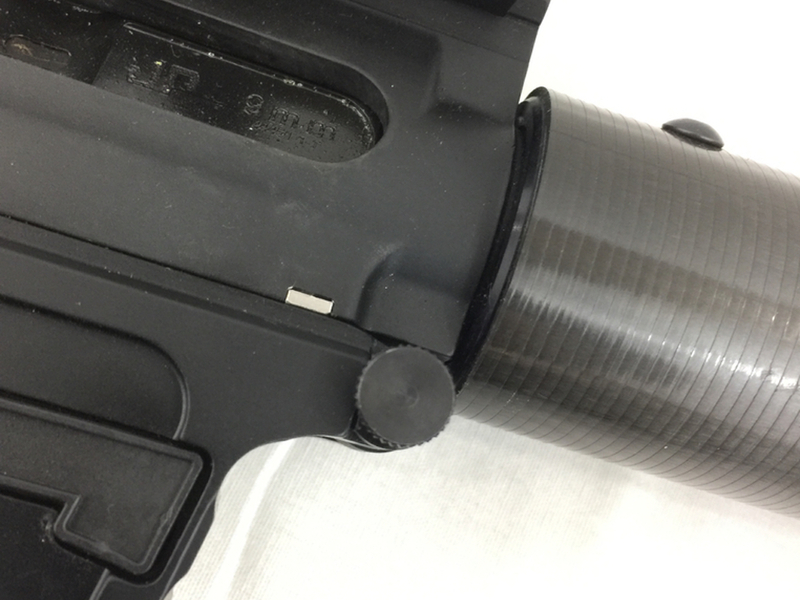 It is held in place by the lower receiver when the weapon is put together. I had FTF trouble right from the start with an AR 9 build from Davidson Defense. I found out about this feed ramp on a forum and ordered the part as soon as I saw it was back in stock. Fast shipping and Tim answered all my install questions on the phone. Tim is a very personable guy and great to do business with. Back to the part… it works flawlessly. 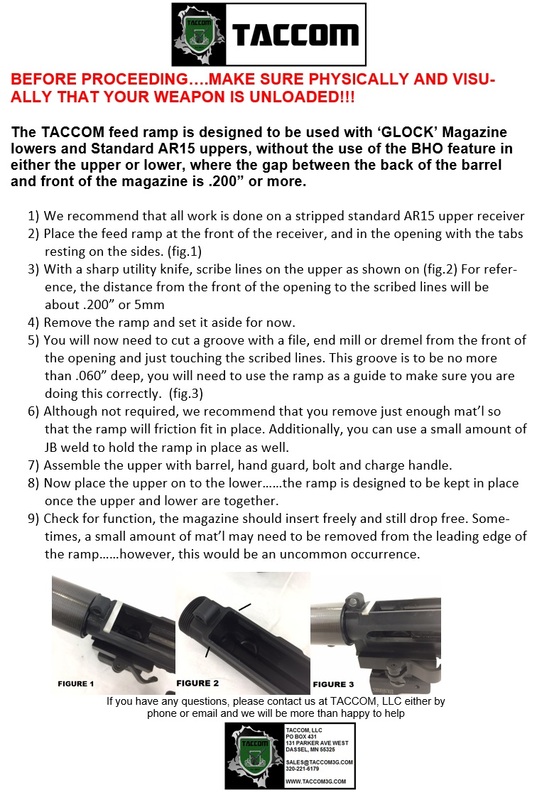 There needs to be something between the magazine and the barrel to bridge the gap and this part does it with flying colors!!!!!!!! This little ramp did the trick and allowed me to feed hollow points reliably. Great product! The product was as describe, the instructions were clear and to the point. I had to call the company for tech advice becausey bolt was hitting the feed ramp. They answered the first time I called and were very helpful in fixing my concern. I am impressed with the product and the professionalism of Taccom. The feed ramp fixed my feeding problems, now to try some hollow points. I will purchase from Taccom in the future. We need more companies in the gun industry like you guys!!! I bought this because I was having feeding issues with most types of ammo, especially with plated bullets. Once I installed it, I have not had any failures to feed. I tried it for a while to make sure everything was working before using JB Weld to secure it in place. I hasn’t moved since then with over 2000 rounds. Fortunately, I have a milling machine which made fitting an easy process. 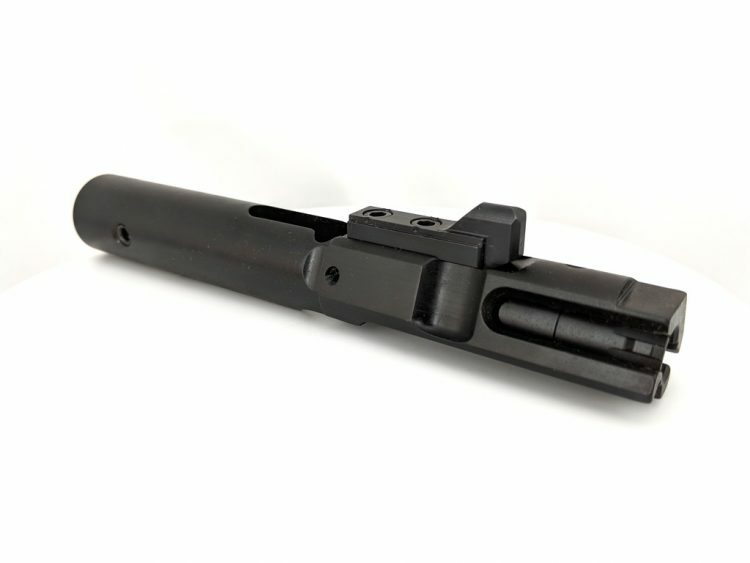 This product made my PCC shooting much more enjoyable knowing the constant jams have been cured. Great product. Thank you Tim. Excellent!!! Just installed and now my AR9 can feed ball tip and hollow point with 0 issues!!! Thanks for the easy fix to my problem!!! Was having terrible failure to feed issues with my PSA AR9. This feedramp is the absolute best 20 bucks I’ve spent in a long time. Completely solved my issue. Ran ~300 rounds through it post install with ZERO failure to feed. It is a little tricky to to get fitted but I did it with some small files and a lot of patience. Took less than an hour. Just follow the instructions. If you aren’t somewhat mechanically inclined you may want to have it installed by a gunsmith. But it’s 100% with the effort!! My new Frontier Armory 9mm PCC had severe reliability issues-not just with hollow point ammo, but also with plated lead bullets. Bullet weight made no difference, either. 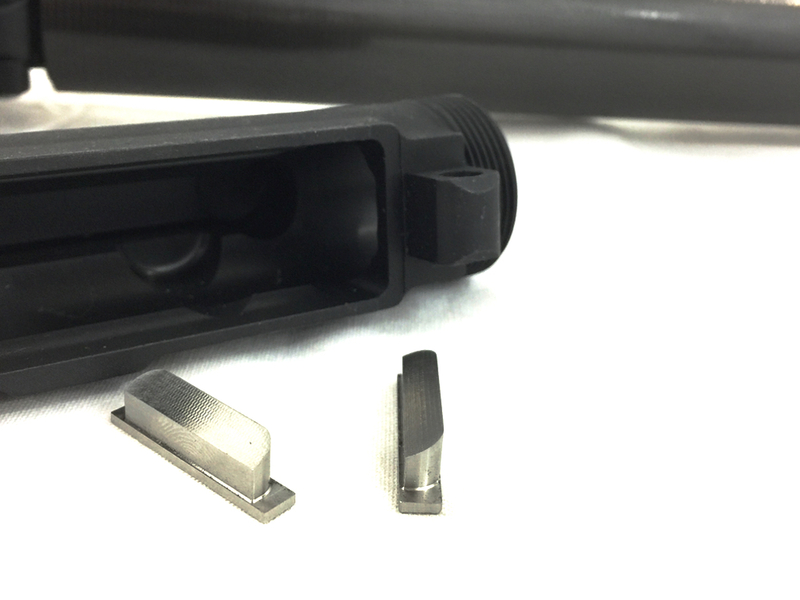 I bought this Glock lower feed ramp and carefully filed a notch in my upper, and with a little fitting, filing, and tweaking, took it to the range with several brands of ammo. It performed flawlessly! All the Hornady critical defense, critical duty, speer gold dots, Federal Premium, and even copper-plated lead hollow points, including H.A.P. cowboy bullets, worked perfectly. This little ramp solved every feed problem my PCC had, and even works with the last round bolt hold-open. I no longer hesitate to shoot it in local matches since installing this little ramp. 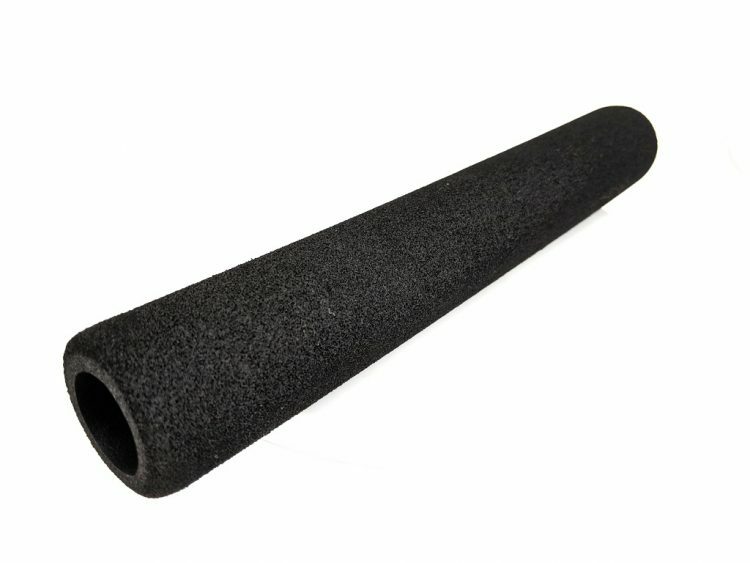 If you are having any feed problems related to Glock magazines, in particular those that have a long gap between the front of the mag and the barrel ramp, then this is what you need. Super happy with this purchase.